(CNN) - Republican Rep. Steve Stockman is launching a primary challenge against fellow Texan Sen. John Cornyn. 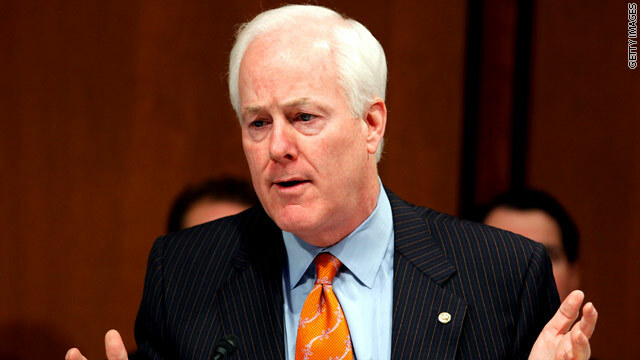 The Senate's second-ranking Republican, Cornyn is up for re-election next year. Stockman, a tea party favorite, told WND that he decided to challenge Cornyn in part because he “undermined” fellow Texan Sen. Ted Cruz’s fight to derail Obamacare. "And now, it looks like Cruz was right and Cornyn was wrong. He [Cornyn] sided with the President, essentially, in making sure Obamacare became law while Cruz did everything possible to stop it,” Stockman said. Texas Republican Party spokesman Spencer Yeldell confirmed reports that Stockman withdrew his application for his congressional seat and filed papers to run in the Senate race. Monday was the filing deadline to enter the race. The primary is March 4. Stockman was elected to the House last year and has been an outspoken critic of President Barack Obama’s Affordable Care Act, or Obamacare. Cornyn was elected to his second term in 2008, taking 55% of the vote against Democrat Rick Noriega. Cornyn kicked off his re-election campaign last month at an event in Austin where he was joined by Texas Gov. Rick Perry and starts his campaign with a hefty war chest of about $7 million, according to Federal Election Commission records. But with only $32,000 cash on hand, according to the FEC, Stockman has a steep financial deficit to overcome. Cornyn's campaign manager said his campaign welcomes a discussion of Cornyn's conservative credentials. “Endorsed by Texas Right to Life and ranked as the 2nd most conservative Senator in America, Senator Cornyn looks forward to discussing his conservative record with Texans," Brendan Steinhauser said in a statement. Cornyn also has the Republican establishment's support in his re-election. "John Cornyn is one of the most conservative Members in the Senate and strong leader for the State of Texas. We proudly support Senator Cornyn and while this primary challenge is quite the head scratcher, it will be defeated," National Republican Senatorial Committee spokesman Brad Dayspring said in a statement. Cornyn is one of seven Republican senators up for re-election next year to face a primary challenge. Other Republicans challenging Cornyn's re-election are businessman Dwayne Stovall and attorney Linda Vega. Oh, goody! It's like having to pick between Benito Mussolini and Idi Amin. Apparently he isn't conservative enough for some people. I would love to see the mud slung in that race. When the winner emerges, he will be so batter that it will be hard to win. Let the GOP savor their short term hold on Texas. The sun is slowly setting for the GOP in the Lone Star state. Goodbye RINO Cornyn and McConnel. Steve Stockman and Matt Bevin will be excellent senators. With the gerrymandering of voting districts by the repubs in 2010, a lot of these repub yahoos are guaranteed to win if they get their party's nomination. One of the by-products of this is the ability for tea bags to easily threaten moderate repubs. So in the end, the tea bag "freedom-lovers" have devised a system wherein they control candidates, who risk being primaried if they deviate from the strict tea bag, inflexible, unthinking, irrational line. And that's exactly what the tea bags want to do to the whole country. So much for freedom! These Guns Over People tea potty wingnuts never stop lying. The good thing is that they now lie about each other. Lying Stockman blames Cornyn for making the ACA a law this year. Hilarious, they deserve each other. 2 incompetent obstructionist GOP fools, time to vote dem!!!! The Tea Party Repbulicans are Nuts. They need thrown out of office not runnung for office.